Do you believe in fate or destiny? I do. I met an interesting musician on a plane recently and I have to share this with you. It was very early in the morning. I get on the plane and take my seat. As is my custom when I travel, I plan to read and listen to music. The passenger in the next seat is a young Hispanic man. He also has a book and an iPod ready to go. He looked tired so I was thinking that he wouldn’t have to read very long before he fell asleep. My fellow passenger introduced himself as Daniel Ochoa Valez. He said he was traveling from Mexico City to Rochester New York. I asked if he was a musician. He said he was studying composition. He was currently studying in Mexico City but he had also studied in Germany, and The Netherlands. “Why are you traveling to Rochester?” I asked. “A friend of mine has helped me obtain a commission.” said Daniel. Daniel had traveled on a bus from Mexico City to Laredo, Texas, cleared customs, got on a second bus to San Antonio, got on a train to Dallas and was now sitting in the seat next to me. He was extremely tired. But he was on an important journey that would ultimately result in a new piece of music for the planet. Daniel has a friend that is the principle Organist for a Church in Rochester. He got Daniel a commission to write a piece for the Church Organ. The Organ is a replica of a Baroque organ in Europe. In preparation for the process of writing the piece, Daniel was flying to Rochester to see the Organ, learn about it’s capabilities, and discuss the composition with the Organist that would perform the debut. He said his friend had figured out ways for the Organ to play quarter tones. Quarter tones are notes between notes. Our western culture does not traditionally contain quarter tones. Other cultures like China, and India regularly use quarter tones in their music. Charles Ives was one of the first American composers to experiment with quarter tones and many modern day composers may employ them. He told me about his You-Tube site. I told him about my blog. We exchanged contact information and agreed to stay in touch. Over the weekend I looked at his videos and really enjoyed his music. I e-mailed him and told him I was going to post him on my blog. I was reading the other day that Thom Yorke (Lead Singer of Radiohead) had a conversation with a recording studio A & R man. The A & R guy asked where all the talented musicians were. Thom yelled at him that they were everywhere but record companies are too afraid to take chances on new music! I agree with Thom Yorke, there is talent everywhere. Not only are record companies afraid of new music, so are most listeners. This is a real shame since so much great music is being written but not getting heard. There is this idea of the “Socially Aware Non-Attenders”. People that understand modern Achitecture and Art but disconnect and can’t seem to support the equivalant when it comes to music. This music will challenge you. You must listen to this music with an open mind and heart. You should listen to each piece a few times. Absorb it. Drink it in. My favorite is Nebula. This compostion was inspired by a poem by Hermann Hesse the Nobel Prize winning author. The poem is about how we can be so disconnected from the people around us that we wander like trees in a fog bank. We can not see or move toward another tree; and yet, there isn’t any fog in real life. Enjoy the music of Daniel Orhoa Valdez. This string quartet is in three movements. Introduction-Intermezzo- and Finale. If you would like to hear more of his work you can serch You-Tube for D8aV and it will connect to his sight. I hope you enjoyed his music as much as I did. I look forward to hearing the composition for organ. Daniel and I were not like the trees in the poem by Hesse. We took the time to make a connection. I for one, am glad I did not stay in my fog bank. Good luck Daniel and keep exploring new horizons! What a music month April was for me. I got to see a live performance of the Beethoven 9th and then on Good Friday I got to see a live performance of the Mozart Requiem! My friend John A and his son Jim A (of the Polk audio event) asked me to attend their Church Concert on Good Friday. Jim performs in the Choir. The Concert consisted of a performance of the Albinoni Adagio in G -Minor, the Mozart Requiem, and Mozart’s Ave Verum Corpus, K. 618. The church had hired an entire orchestra in order to perform these compositions. The evening started with the Albinoni Adagio. This is a very beautiful and quiet piece. It is scored for solo violin, strings and organ. The adagio has a haunting melody that floats over the quiet muted sound of the organ. The piece builds to a climax that leads into a highly emotional and beautiful cadenza from the first violin. The first violin’s solos were just fantastic. She is quite a good musician. The entire adagio was admirably performed with quiet dignity and introspection, setting up the reverent atmosphere for the performance of the Requiem. Although this piece is attributed to Albinoni, it is largely the work of his 20th century biographer, Remo Gizaotto. Remo found a small fragment of the composition in the Saxon State Library in Dresden, Germany shortly after the end of World War II. The Library had been destroyed in the Fire Bombing of Dresden but the staff had already evacuated and preserved most of its collection. It is believed that the fragment was a portion of Albinoni’s Sonata de Chiesa Opus 4 written around 1709. I think it is an interesting programing choice because it is really an unfinished composition that was finished by someone other than the composer; just as Mozart’s Requiem was finished by his student, Sussmayr. 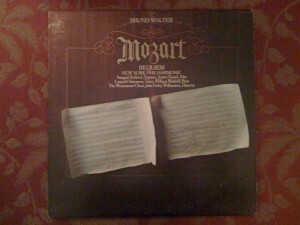 The Mozart Requiem is one of the true masterpieces of music. It is scored for 4 Soloist, Choir, I and II Violins, Viola, Cello, Bass, 2 Basset Horns, 2 Bassoons, 2 Trumpets, 3 Trombones, Timpani, and Organ. The entire evening was directed by Jody Lindh, who is the director of music ministries for the University Park United Methodist Church. Two soloist were from the SMU school of music and two were from the church choir. This composition is extremely challenging to professional singers let alone a church choir and student soloists. But this group was up to the challenge. Each soloist did a great job. I thought the standouts were the soprano, Tiffany Roberts Silva and the baritone, Ken Carroll. The orchestra played flawlessly, and choir was extremely well rehearsed for the occasion. There were a few ragged moments and some phrases were not ended as cleanly as they could have been and you could occasionally hear the strain on the choir in some of the more difficult parts, but overall it was a magnificent effort! The Director, Jody Lindh had the right mix of forward looking Romantic era emotion and structured Classical era restraint. At the request of the music director, applause was reserved until the completion of the Ave Verum Corpus, K. 618. This was probably because of Easter and the need to celebrate the resurrection, not just remember the death or Jesus Christ. Congratulations to all involved in this moving ceremony on Good Friday! I thought this was a great opportunity to blog about the controversy surrounding the composing of the Mozart Requiem. The controversy has even become more fueled by the romanticized fantasy of the play and movie Amadeus. How much of the Mozart Requiem is Mozart’s own work and how much had to be filled in by Sussmayr? Sussmayr claimed to have written the last three movements in their entirety. (Sanctus, Benedictus, and Agnus dei, Communion). Hmm…. Let’s go back and revisit the history. In the summer of 1791a mysterious messenger came to Mozart with a commission to compose a Requiem Mass. Mozart, being in difficult financial straits and failing health accepted the offer. He was already very busy composing his last two operas: The Magic Flute, and La Clemanza di Tito. The operas overwhelmed his task to write the Requiem so he set it aside to complete the two operas. In September of 1791 he began anew the effort to complete the Requiem, after another visit came from the mysterious messenger. In Mozart’s fragile physical condition he began to imagine that the commission from the mysterious visitor was from the other world and that the Requiem was for himself. It turned out to be from Count Franz von Walsegg, who wanted to remain anonymous because he intended to pass the work off as his own composition in honor of his recently deceased wife. A short distance from his home where he lay ill, The Magic Flute was having a very successful run. Mozart worked as quickly as his failing health would allow. Occasionally some of the cast would come over and sing through some of the portions of the Requiem. The last time this happened was on December 4th, 1791. Mozart sang the alto part and they got as far as the Lacrimosa. Later that night he lapsed in to a comma and died the next day. The Requiem was unfinished. Constanze(Mozart’s wife) was left with many debts. She desperately needed the money from the commission. She turned to Josef Ebler, a local musician. He felt he could not fulfill the task. She appealed to Albrechtsberger and Stadler. (Albrechtsberger taught Beethoven and Stadler was one of Beethoven’s friends). They could not or would not help. As a last resort she turned to Mozart’s 25 year old student Franz Sussmayr. Constanze stated that she gave Sussmayr all of the sketches that Mozart had left. In addition, Sussmayr stated that on Mozart’s death bed he had carefully explained his intentions on completing the Requiem. Sussmayr said that Mozart’s last breath was expended phrasing a drum passage. The autograph manuscript contained only the completed Introit and Kyrie and the vocal parts and figured bass (a type of musical short hand) of the Dies Irae sequence (Movemetns II-VII) up to the 9th bar of the Lacrimosa. The Offertory (Domine Jesu and Hostias) had only the vocal parts and figured bass. Nothing has ever been found in Mozart’s own hand of the Sanctus, Benedictus, and Agnus Dei. This is one of the reasons that Sussmayr claimed that he had written these movements himself. Constanze, who gave him what she described as “slips of paper” on which Mozart had written his ideas for the Requiem, insisted that Sussmayr only did what anyone else could have done. One thing is certain, the quality of the music far exceeds anything Sussmayr ever came up with before or after. Was he really capable of echoing the masters voice so faithfully with any real guidance? I doubt it. This music is far too complex for a mortal to have come up with. The Requiem looks back to Bach while looking forward to Beethoven, Shubert, and Brahms. Just as in the final Symphonies Mozart inserts amazing fugues and double fugues, summoning up the spirit of Bach. But the emotional content is distinctly forward looking to the more emotional, expressive content of the Romantic era. Sussmayr had two duties: first he had to provide the Sanctus, Benedictus, and Agnus Dei with the Communio. He also had to score a lot of the Requiem. Mozart chose the specialized scoring. (Strings, organ, trumpets, drums, trombones, bassoons, and basset horns.) The omission of flutes, oboes, and horns is carefully calculated to create a more austere and archaic tone and mood. There is an alternate version of the Requiem that was produced by Franz Beyer, a professor of Music from Munich, Germany. His goal was to restore the Requiem to it’s more pristine colours and to correct the factual mistakes in the score. He felt that Sussmayr had some very incorrect instrumental accompaniment and enriched harmonies that attempted to prettify the work instead of it’s more stark intention. An obvious misrepresentation is in the Tuba Mirum where the trumpet continues to sound even after the dead are already called to Judgement. Beyer extensively reworked the basset horns and trombones to bring it into line with practice. He fixes the tuba mirum trumpet miss-step. He makes some small corrections to the vocal lines, the dynamic marks and tempi indications and adds an extra cadence to fix the fore shortened Osanna fugues. I offer to you now both versions of the Requiem. The original Sussmayr (the version I heard on Good Friday) and the newer Beyer edition. The Sussmayr is performed by Bruno Walter and the New York Philharmonic and the Beyer edition performed by the The Academy of St. Martin-in-the-Fields conducted by Neville Marriner. I am placing the movements side by side so that you can more easily compare them. The Neville Marriner -Beyer perfomance is my own LP and the Bruno Walter-Sussmayr performance is an LP I borrowed from my brother Joe. 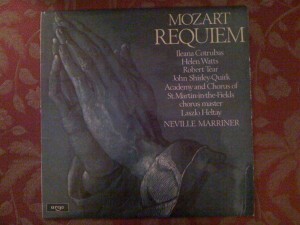 So is the Requiem written by Mozart or not? My opinion is the same as Beethoven. When Beethoven was asked about the Mozart Requiem he said, “If Mozart did not write this music, then the man who wrote it was a Mozart!” Sounds almost like a Yogi Berra comment doesn’t it? It is interesting that Walter envisions the first two movements as one movement. He leads the orchestra directly into the Kyrie without pause. Marriner makes sure to signal that they are separate movements. Once again Walter envisions the last two movements as one movement; where as Marriner envisions them as two distinct movements. So what do you think? Is the Requiem Mozart or Mozart/Sussmayr? Which edition of the Requiem do you prefer? Let me know your thoughts. Personally, I prefer the Beyer edition. I think it is more true to the intention of Mozart. He did not want the Requiem to be Operatic. His intention was to look back to the time of Handel and Bach while looking forward to the highly emotional Romantic era. Any thoughts?